Disturbed by this continual increase in waste, Stanford engineer Zhenan Bao and her team are rethinking electronics. She explained how skin is self-healable, stretchable, and also biodegradable – an appealing list of features for electronics. In my group, we have been trying to mimic the function of human skin to think about how to develop future electronic devices. We have achieved the first two [flexible and self-healing], so the biodegradability was something we wanted to tackle. The team built a flexible electronic device that can be easily degraded by adding a weak acid like vinegar. The results were published in the Proceedings of the American Academy of Sciences. 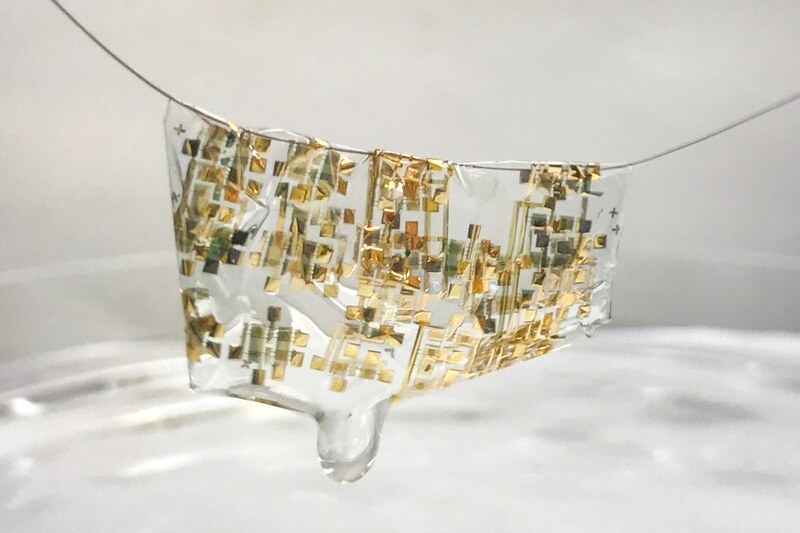 Besides the polymer – basically a flexible, conductive plastic – the team created a degradable electronic circuit and a new biodegradable substrate material for mounting the electrical parts. This substrate supports the electrical parts, flexing and molding to smooth and rough surfaces alike. When the electronic device is not needed anymore, the whole device can be biodegraded into nontoxic parts. Bao, a professor of chemical engineering and materials science and engineering, had earlier developed a stretchable electrode modeled on human skin. That material could twist and bend in a way that could allow it to interface with the brain or skin, but it could not degrade. That restricted its application for implantable devices and – important to Bao – added to the waste. Bao said that developing a strong material that is both biodegradable and a good electrical conductor was a quite a task, bearing in mind traditional polymer chemistry. “We have been trying to think how we can achieve both great electronic property but also have the biodegradability,” Bao said. Finally, the team discovered that by tuning the chemical structure of the flexible material it would disintegrate under mild stressors. We came up with an idea of making these molecules using a special type of chemical linkage that can retain the ability for the electron to smoothly transport along the molecule. But also this chemical bond is sensitive to weak acid – even weaker than pure vinegar. The result was a material that could transmit an electronic signal but degrade without requiring great measures. Along with the biodegradable polymer, the team built a new type of electrical component and a substrate material that adheres to the whole electronic component. Electronic components are typically made of gold. But for this device, the researchers made components using iron. Bao highlighted that iron is an extremely environmentally friendly product and is not toxic to humans. The researchers developed the substrate, which holds the electronic circuit and the polymer, from cellulose. Cellulose is the same material that is used to form paper. But unlike paper, the team modified cellulose fibers so the “paper” is flexible and transparent, while still disintegrating easily. The thin film substrate permits the electronics to be worn on the skin or even implanted in the body. The combination of a substrate and a biodegradable conductive polymer makes the electronic device beneficial in a numerous settings – from wearable electronics to extensive environmental surveys with sensor dusts. We envision these soft patches that are very thin and conformable to the skin that can measure blood pressure, glucose value, sweat content. A person could wear a specially designed patch for a day or week, and then download the data. According to Bao, this short-term use of disposable electronics seems like a perfect match for a flexible, degradable design. And it is not only for skin surveys: the biodegradable substrate, iron electrodes, and polymers make the whole component well-suited for implanting into the human body. The polymer breaks down to product concentrations a lot lower than the published acceptable levels observed in drinking water. Although the polymer was found to be biocompatible, Bao said that further studies would need to be conducted before implants are regularly used. Biodegradable electronics possess the prospect to go far beyond just gathering heart disease and glucose data. These components could be applied in areas where surveys cover large regions in remote locations. Lei described a research situation where biodegradable electronics are dropped by aircraft over a forest to survey the landscape. “It’s a very large area and very hard for people to spread the sensors,” he said. “Also, if you spread the sensors, it’s very hard to gather them back. You don’t want to contaminate the environment so we need something that can be decomposed.” Rather than plastic littering the forest floor, the sensors would biodegrade away. The study’s other authors include Ming Guan, Jia Liu, Hung-Cheng Lin, Raphael Pfattner, Leo Shaw, Allister McGuire, and Jeffrey Tok of Stanford University; Tsung-Ching Huang of Hewlett Packard Enterprise; and Lei-Lai Shao and Kwang-Ting Cheng of University of California, Santa Barbara.